Beautiful work, Chuck. I really like the action and the slow running. I can see several of these being made if drawings become available. Fantastic work Chuck! Beautiful fit & finish. That's cool Chuck! Lovely work. A beautiful model Chuck and a fine addition to your collection. Thanks, to all you folks, for the support during this project. It's provided me the inspiration to continue and to make this the very best model I could. In fact, it's probably the best job I've ever done in terms of beauty and precision. And, I discovered another thing last night. I took the engine to my monthly meeting of the Austin Metal Working group to show it off. One of the guys asked me if it was reversible and I said no, figuring the valving for one direction was about the limit of my ability and, to be honest, I wasn't even sure which direction the engine would run until a fired it up. Well, one of the fellows, Ed Hume, who does a lot of steam engine work asked why I don't just feed the air into the exhaust side to reverse it. At first, I thought it can't be that simple. Well, it was. The engine does indeed run the other direction if I reverse the air input. Happy Accident! So, now I'm going to design and build a throttle/reversing valve and figure out where to attach it permanently to the engine. Just saw Brian's reversing valve. Looks like it might work on my engine as well. Congratulations on an outstanding build Chuck! The construction and detail of the parts is first class. I'm really amazed at how smoothly it runs. Thanks for documenting the build. The engine has a very fluid motion, very smooth. Simple and beautiful. 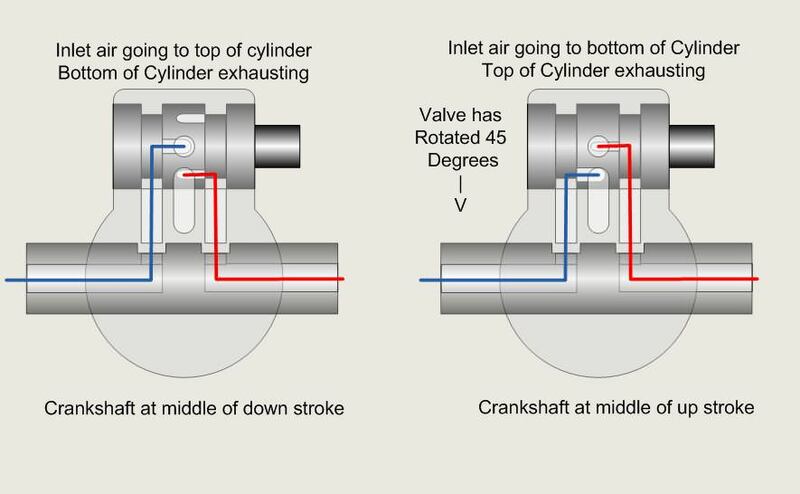 Okay, folks, here goes an attempt to explain the valve set up. First, a 2-D drawing. 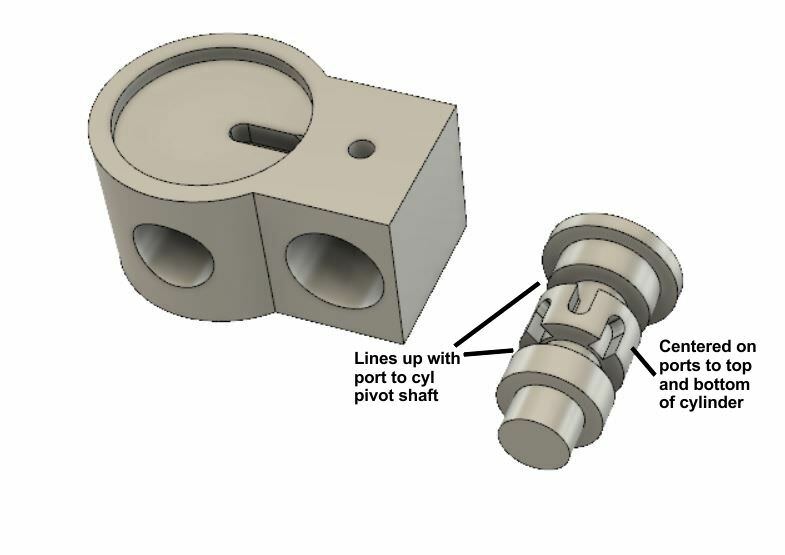 Understand that the rocking motion of the cylinder effectively causes the valve to rotate 45 degrees back and forth with respect to the cylinder. 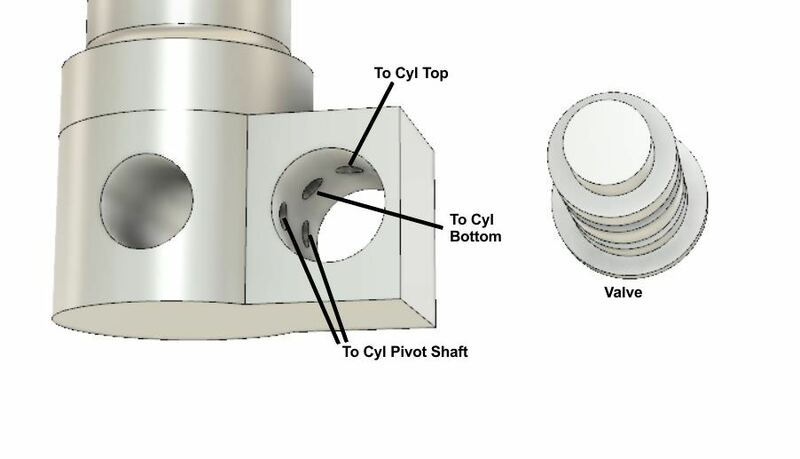 Here is a 3-D exploded view of the cylinder base, cylinder pivot shaft, and valve. All the ports are shown but may be hard to make out. 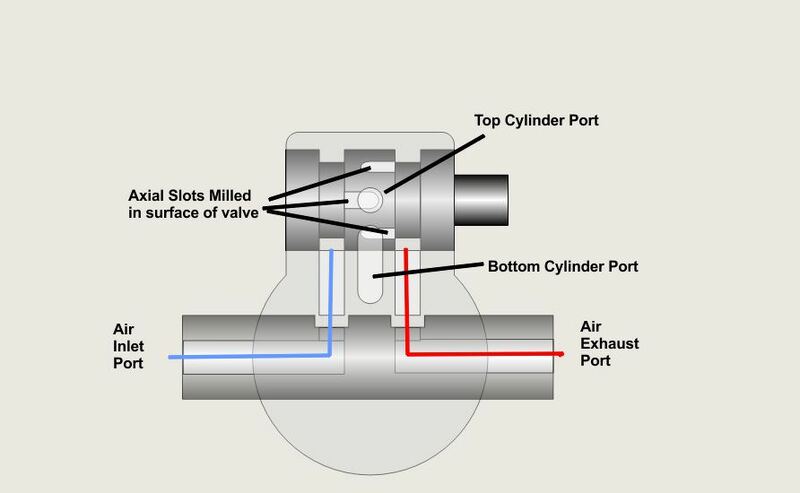 As the valve rotates with the cylinder motion, the ports to top and bottom of the cylinder are alternately connected to the annular valve slot on the left, then the right through axial milled slots on the surface of the valve body. 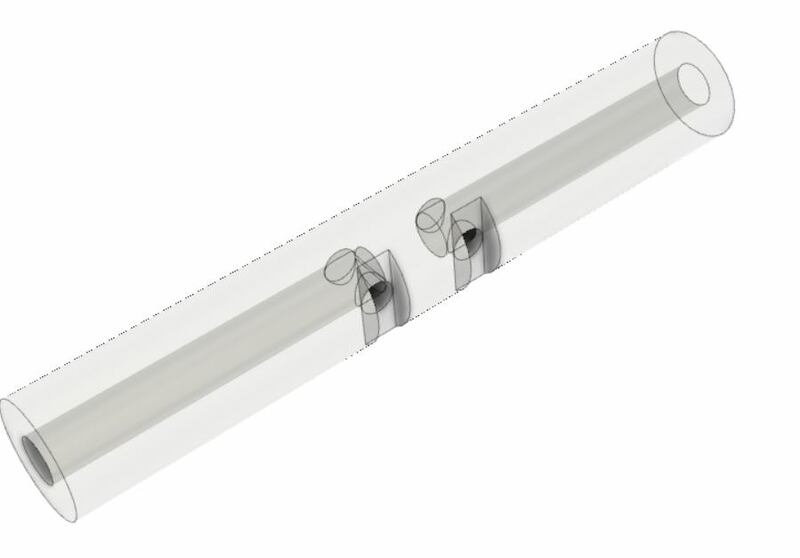 More pictures from the drawings which shows different views of the parts and ports. 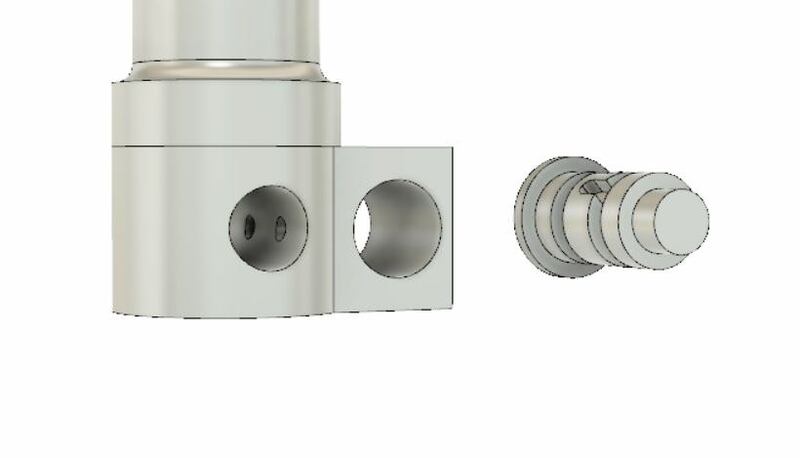 A closeup of the cylinder pivot shaft..
Keep in mind that even tho I've labeled ports as inlet and exhaust, I later learned that reversing the airflow will reverse the engine rotation direction. 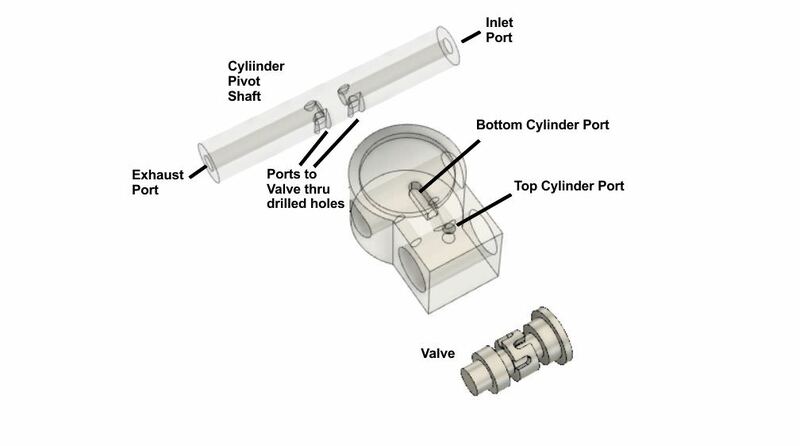 Many thanks for the explanation of the valve Chuck. That helps a lot!! Now I see how it works! Thank you very much for the drawings and explanation, Chuck. Very clever bit of work, that. An absolute beauty Chuck. Definitely deserves a Round Rock doughnut. What is your favorite flavor Chuck? Bad Behavior has blocked 15682 access attempts in the last 7 days.